5 Minutes for Fido: Gamma2 Goes to Blogpaws with Oliver: No?! Gamma2 Goes to Blogpaws with Oliver: No?! I'm not a happy camper right now. I just got this super cool new TRAVEL-tainer by Gamma2 and a Vittles Vault Jr. to carry along extra food since I eat sooooo much (NOT!). But now I've learned that I'm not going to Blogpaws. Here I dusted off my carrier, tested it out, and.....bad news. Humph! The only good part is that Tanner doesn't get to go in my place. He'd be fetching half the food off the buffet and engaging all the other dogs in tag games. Talk about a dogpark showoff! Speaking of showoffs, Sunday my mom and the mom over at Dogtipper (Tiki and Irie's mom) will be having another Twitter Party, this time for Gamma2. Mom has been having fun teaching Twitter 101 to the Gamma2 folks, sharing their Gamma2 G-Men video with half the Internet, and well, Grandma's move made for quite the exciting week. Here adopted Papillon is NOT my cousin, but for some reason my mom calls him the Cousin. Go figure! 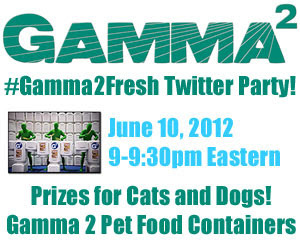 Anyway, I wanted to share the fun G-men video and make sure you all remember to RSVP for the #Gamma2Fresh Twitter Party so you can win patented, airtight food containers for your Woof and Meow. See you there!